It's another dog treat review! As has been the case with all of our mostly-pointless pet treat reviews, the dogs inhale the treats with reckless abandon despite the fact that they're clearly optimized for larger dogs. 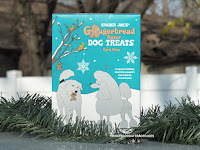 However, in this case, the cute gingerbread man shapes lend themselves to easy bite-size snacks for small dogs by simply decapitating and/or amputating limbs from the hapless cookie men. Be sure to click on the video, because this one features beautiful Christmas decorations, animals wearing hats, and my lovely wife eating dog food! Enjoy! Our box is almost empty and we need to restock! Our dog, Gromit, is a sucker for these. They're easy to snap apart, so one gingerman goes a long way with small and medium sized dogs. Named after Wallace & Gromit, I assume? Cool name for a dog! Yes, we named our dog after our favorite movie dog. However, being a dalmatian/poodle mix, he looks more like Shawn the Sheep. Shawn the Sheep the Dog! My name is Zoe annd i am a yello lab. momma doesesn no that i get on the internet but i do even though i am not a grate typer. i want to thank nathan for reviewing these and to say that me and my sister Caicos (also yello lab) luuuvvvvv them even more than other tj treeets. i wish tjs has these all year!